Equal parts old world charm & modern design, this estate is an elixir for a spectacular revelry of the senses. 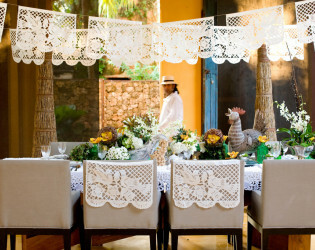 There has been no expense spared nor a celebration not considered. Intimate weddings or larger celebrations of up to 150 guests, group getaways, friend and family reunions, spectacular dinner or birthday parties, it is surely a setting for the most luxe of nomads. 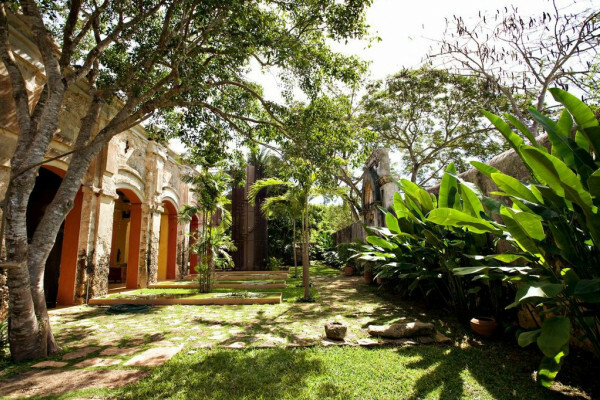 The historical Hacienda Tucked away on the lush grounds of Hacienda Sac Chich, Casa de Maquinas is a complex of 3 limestone buildings, a water tower and an 85 ft. chimney. 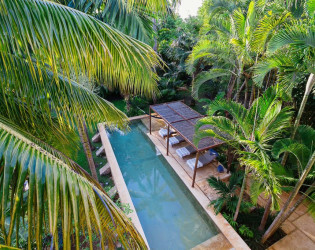 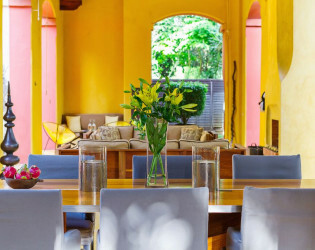 Surrounded by palm filled gardens Casa de Maquinas consists of three 2000sq.ft. rectangular structures that date to 1850. 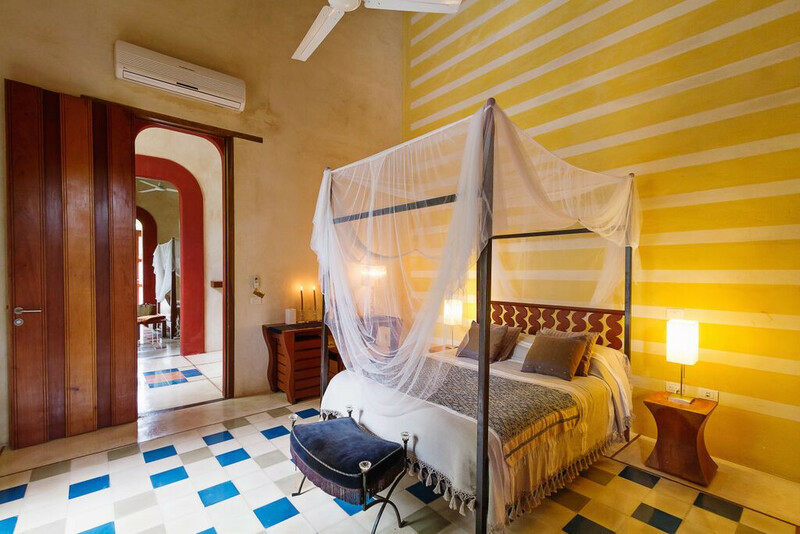 Throughout the hacienda there is evidence of its previous utilitarian life. 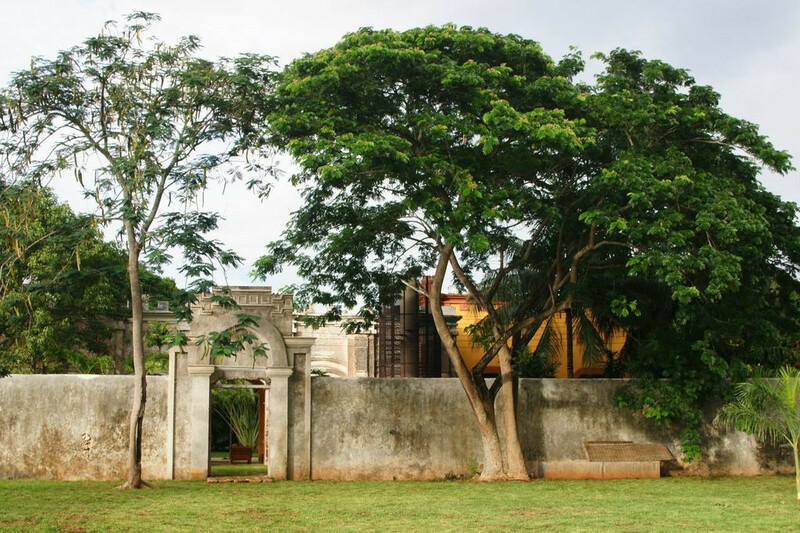 Iron wheels and massive beams are remnants of its past. 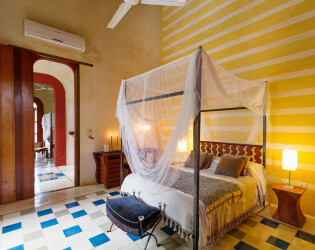 One building, CASA ANTIGUA, houses the living room, 2 king bedrooms, a loft bedroom with a queen and a double and 2 bathrooms and a colonial kitchen. 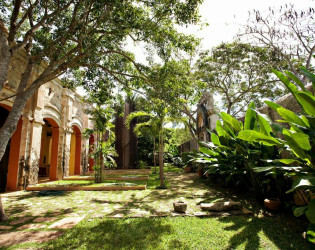 Opposite the Casa Antigua is another building, the CASA NUEVA, where a dramatic central hallway is the entrance to 3 bedrooms and 3 bathrooms, all with soaring 26’ ceilings and 13’ high doors. 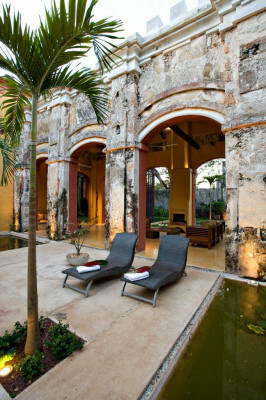 The large master has a sunken living area, and outside within a walled garden is a settee and plunge pool. 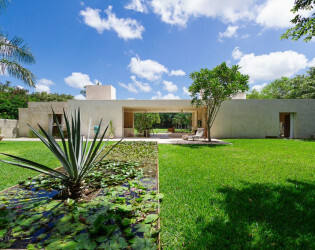 Between these two buildings the open-air living room and dining pavilion, the Loggia, is surrounded by lily and fish filled reflecting water ponds and dramatic lighting. 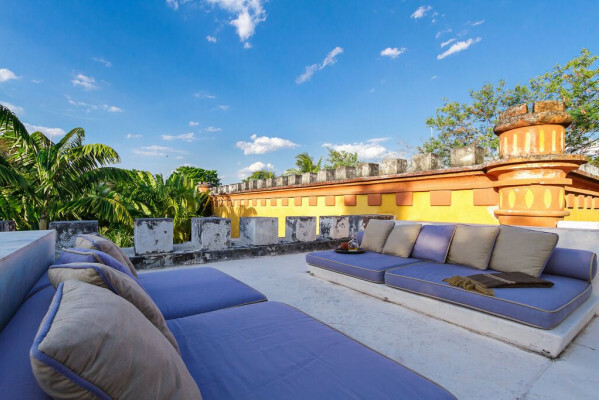 From the loggia climb an enclosed spiral staircase to a rooftop lounge and star-viewing platform. 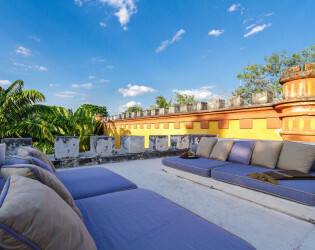 Here you can watch the moon, stars, sunset, an approaching storm or enjoy the night breeze. 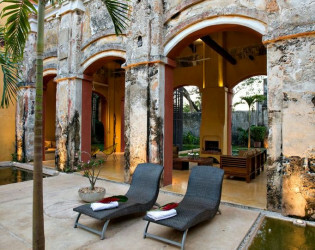 Through a seashell mosaic tunnel from the inner courtyard you find the 40-foot pool. 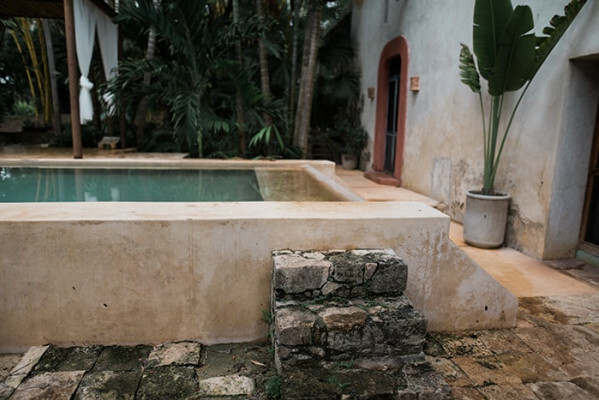 Once the water tank for the hacienda, the freshwater pool is now a shimmering refuge from the heat of the Yucatan. 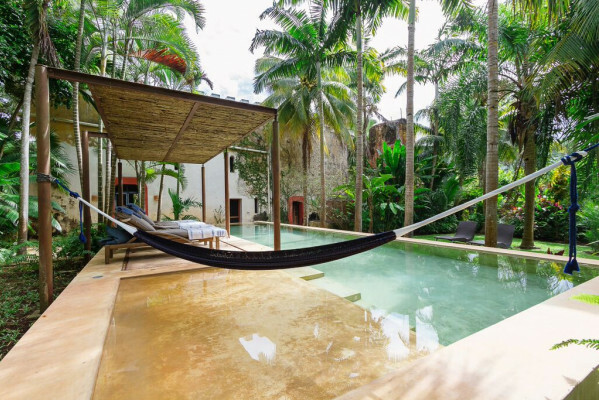 A steel and bamboo pergola and a playita of shallow water with a hammock suspended above provide areas for rest and shade. 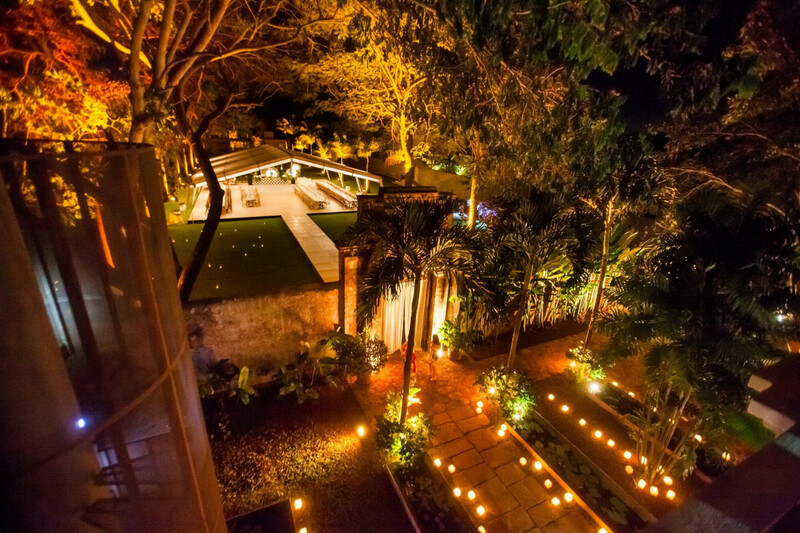 Beyond the pool, in a hidden garden you find the regulation size bocce ball court. Framing the entire hacienda are dry stacked stonewalls, tall hedges of fica and walls creatively designed with metal cages filled with local limestone. 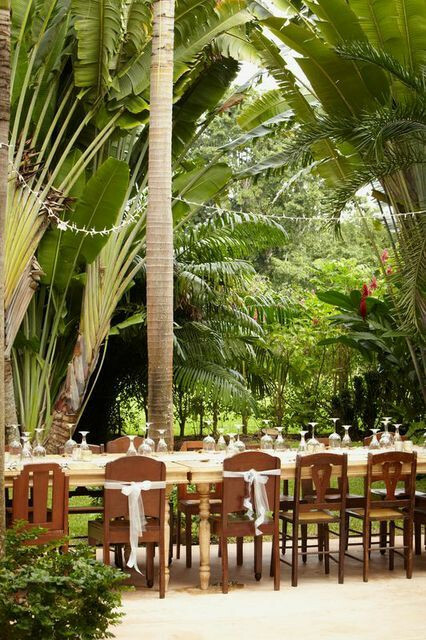 The grounds are filled with exotic rare palms, bamboos, gingers, tropical plants and fruit trees. 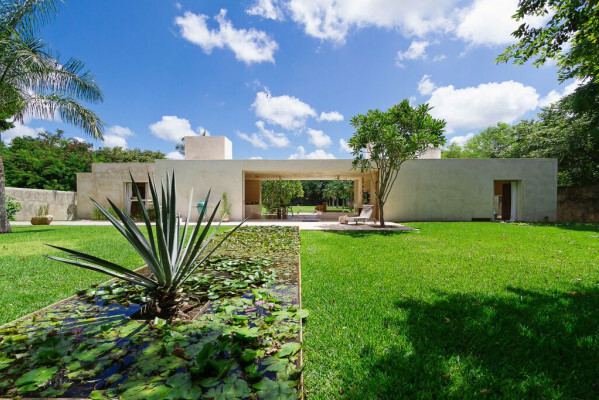 The house restoration has been a project of the renowned Mexican architect Salvador Reyes Rios and his partner and wife Josefina Larrain. 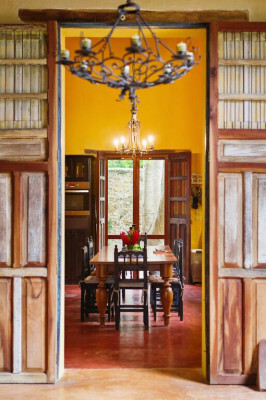 Most of the furniture throughout is designed by Salvador and fabricated locally. 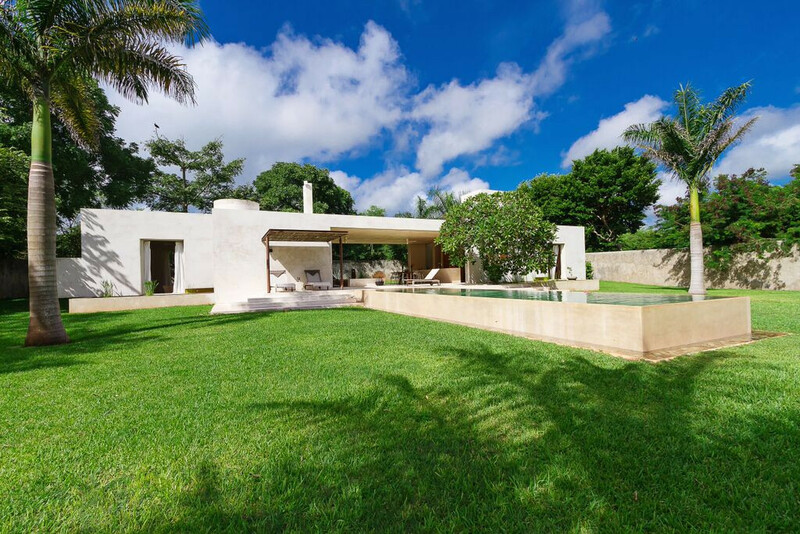 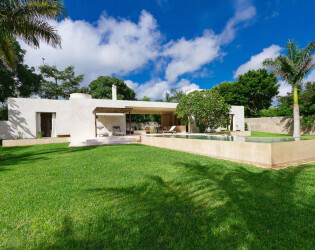 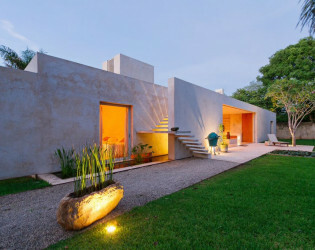 Casa Sisal Relax in the privacy of this contemporary home. 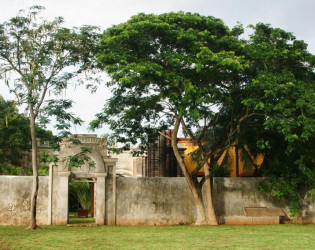 Casa Sisal is adjacent to Hacienda Sac Chich, Casa de Maquinas. 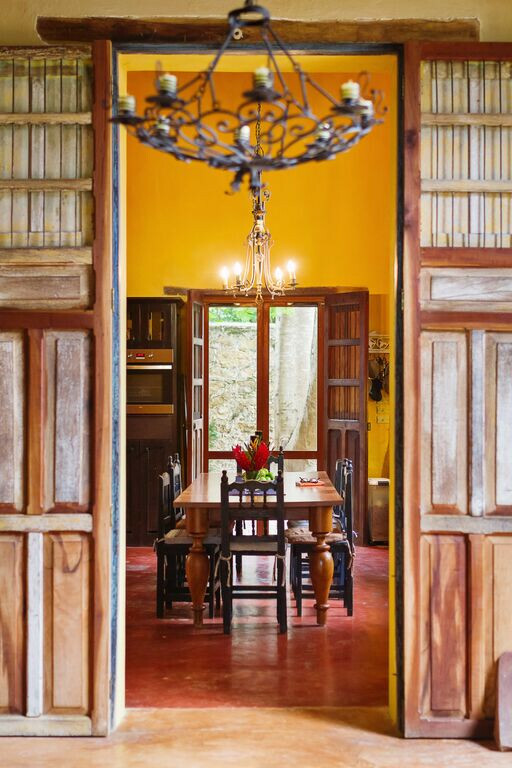 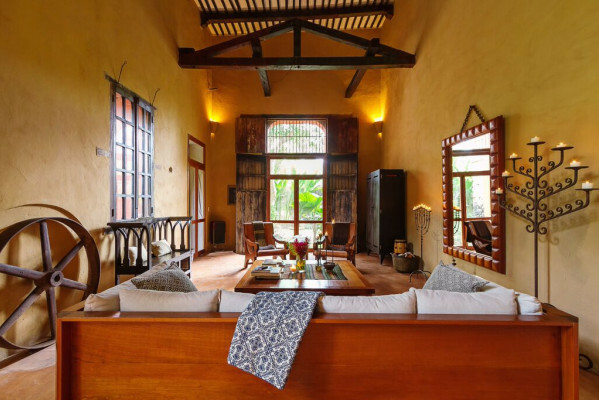 Surrounded by water lily reflecting ponds and a large green lawn, this 2000 square foot home is built within the 2 acre henequen drying fields of the hacienda and is enclosed by the haciendas original 10-foot wall, creating its own private world. 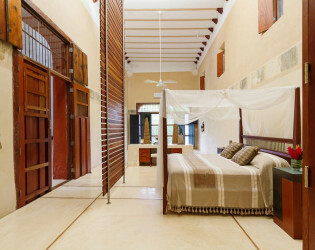 Casa Sisal has 2 bedrooms (one king and 2 queens), 2 baths, full kitchen, living area and dining for 8. Walk out of the living area on one side you’ll find a patio with a 30- foot lily pond and out the other side is a beautiful 3-sided infinity edge swimming pool, palapa and patio. 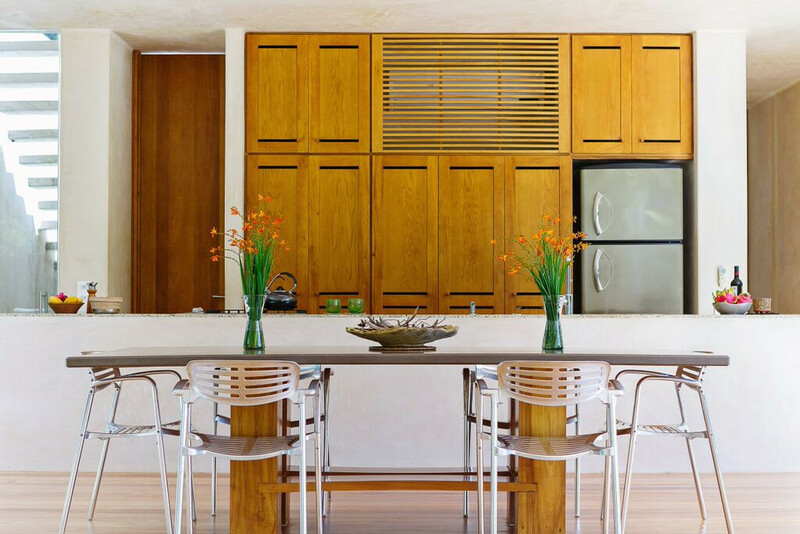 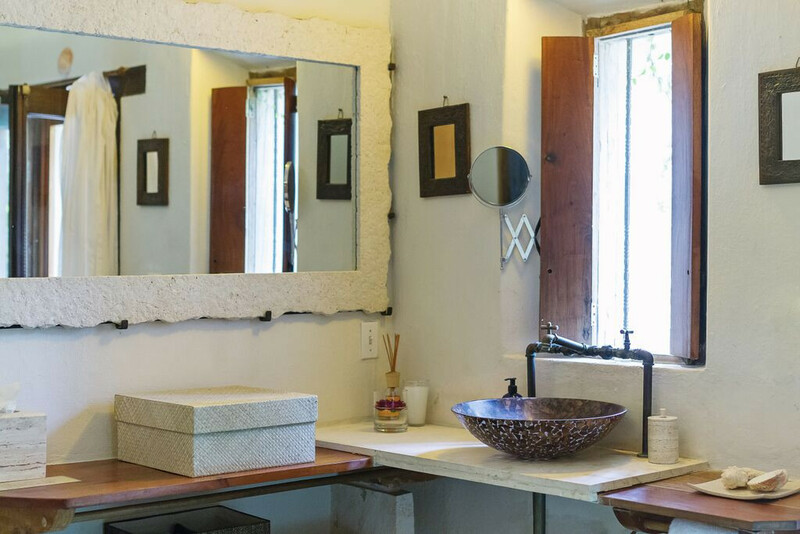 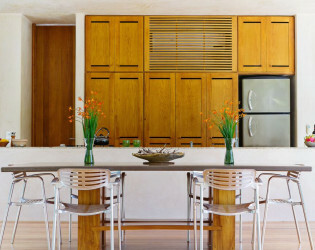 This home is constructed of hard woods, limestone and plaster polished to a sleek finish by the ancient Mayan technique called chukum. 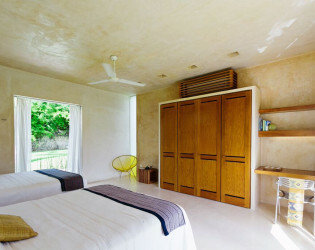 The ceiling and door heights are 10 feet giving every room a sense of great space. 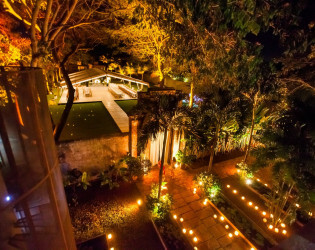 The house is lit very dramatically and on the lawn there are two rows of royal palms that at night seem to be suspended in space. 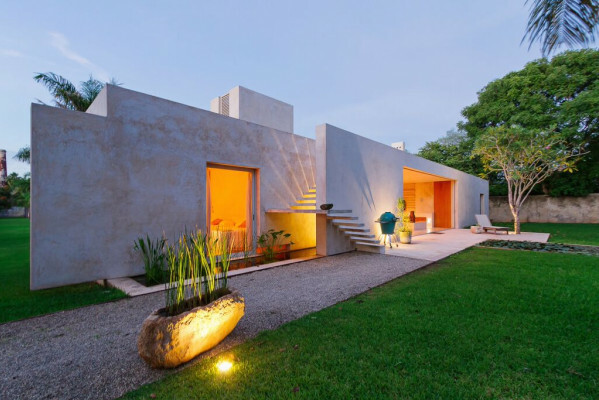 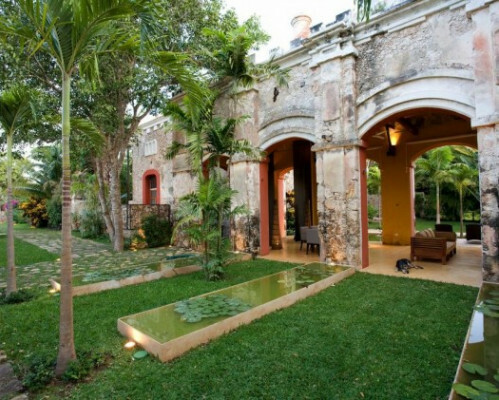 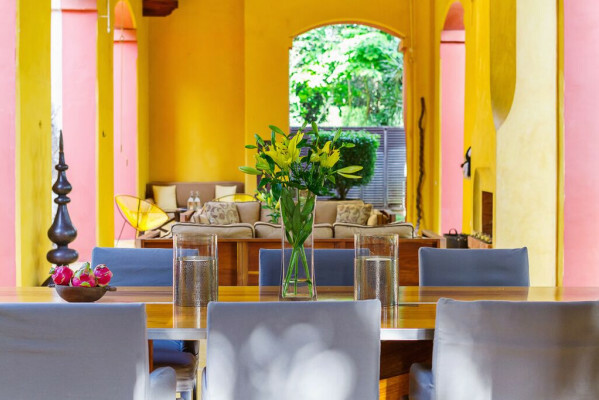 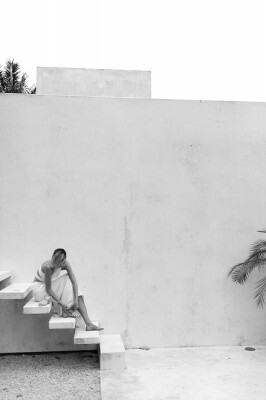 Designed to experience the beauty of the Yucatan light and sky you will find Casa Sisal a respite from it all. 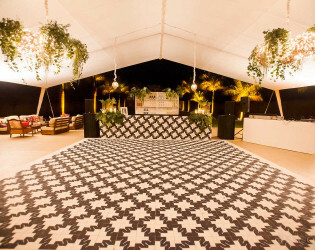 The venue fee is $3000 for groups upto 100 and $10/person above that. 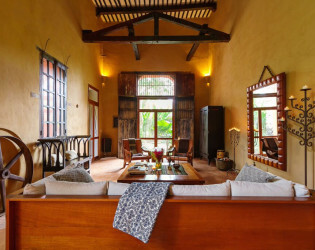 In addition there is a 5% gratuity fee which is distributed between the house and garden staff. There are 6-bedrooms and 5-baths in the hacienda property which can sleep 13 in 4-kings, 2-queens and 1-double. 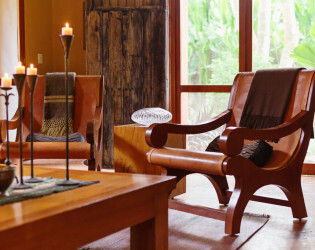 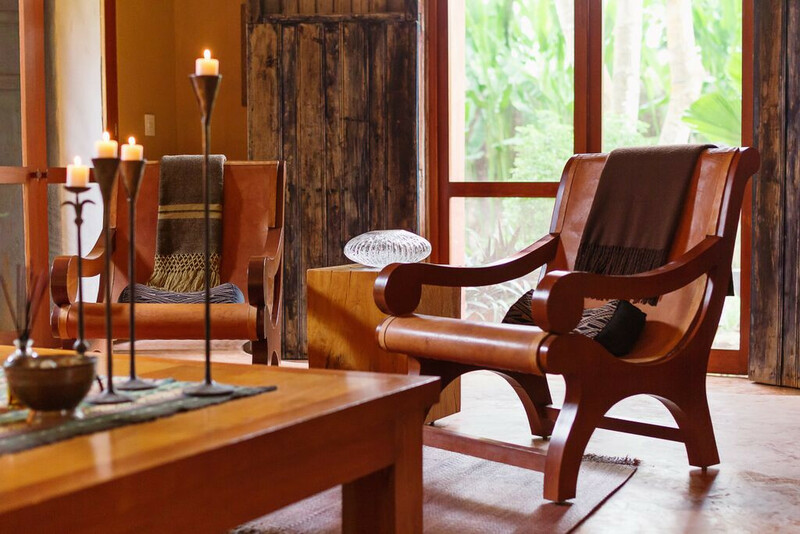 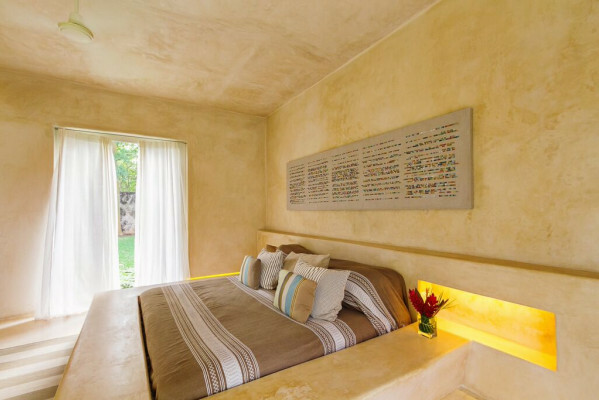 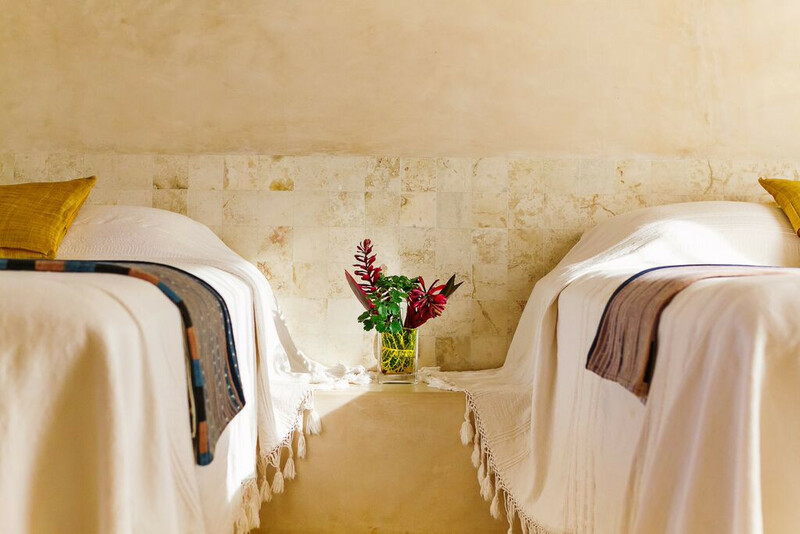 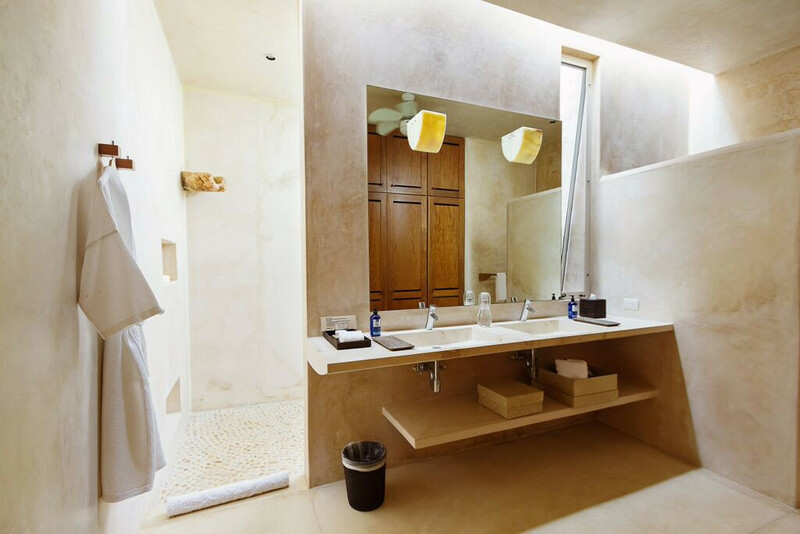 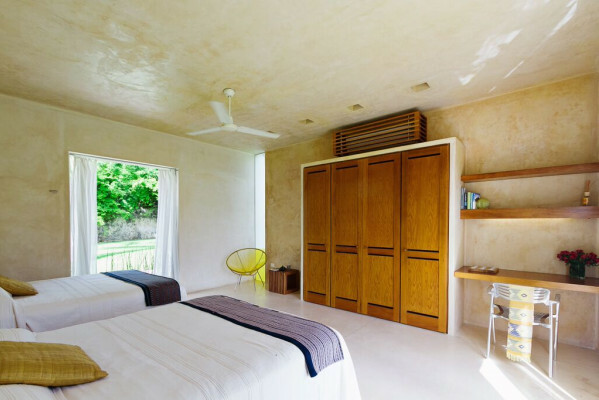 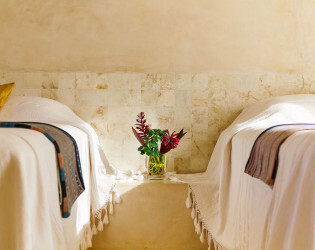 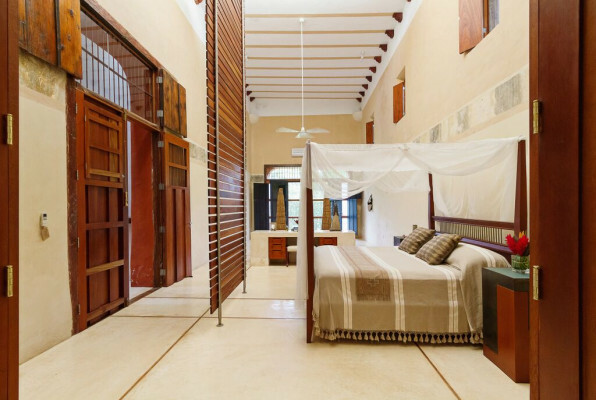 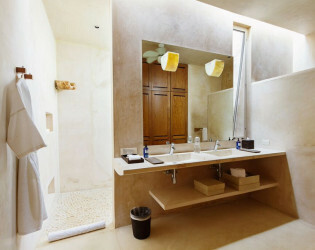 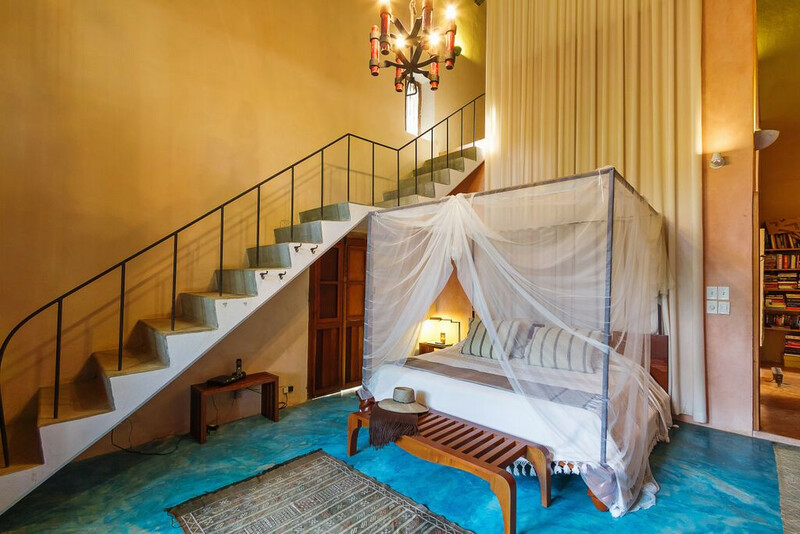 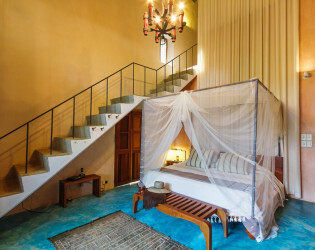 Casa Sisal can sleep 6 in 2-bedrooms, consisting of 1-king and 2-queens, for a total of 19. 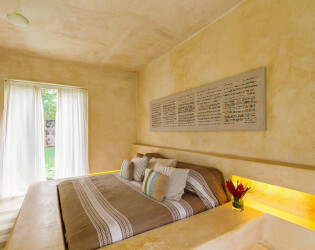 An addition single bed is available for an additional charge. 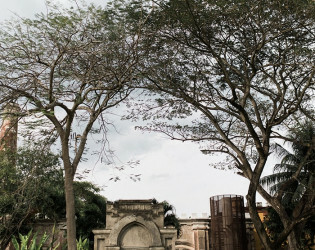 Trying to find the time to take in all the amazing viewpoints from which to admire the views, architecture, flora, sunsets etc. 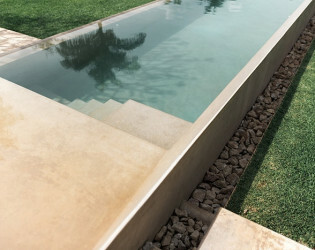 will be your biggest challenges! 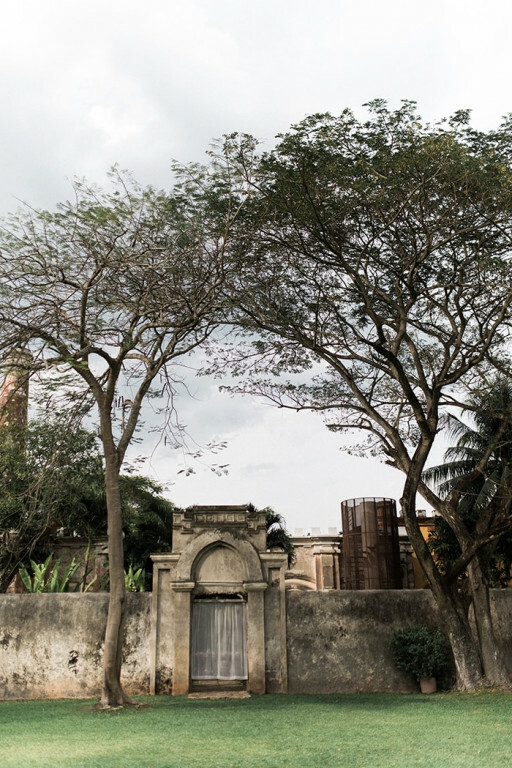 The castilian architecture with its 3ft thick walls, 24ft ceilings, turrets and crenelation harkens back to when these buildings were the factory where sisal was grown, harvested and processed into twine, rope and woven fiber. 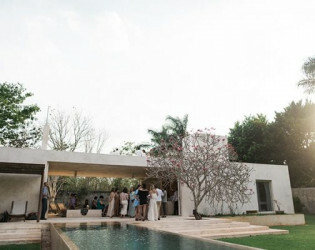 The transformation of this property into this special residence has created a unique and special space to share with friends and family. 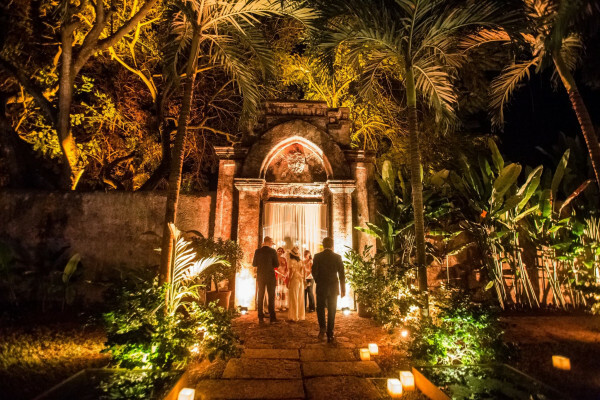 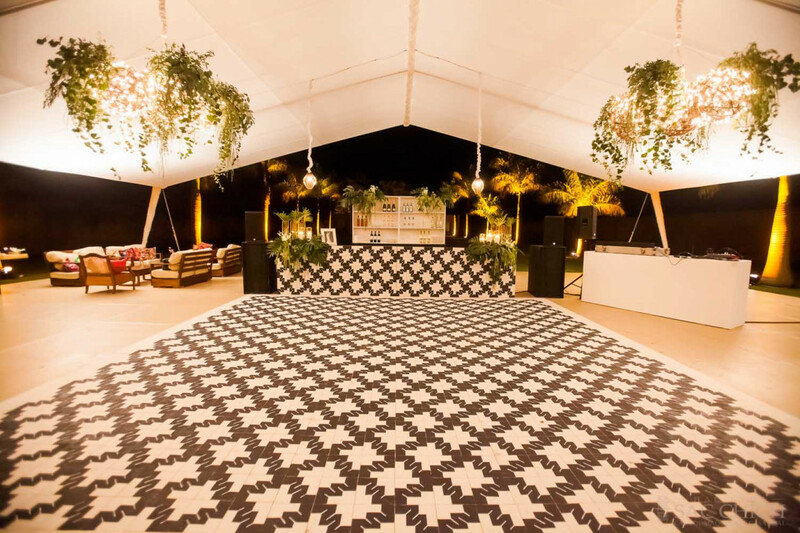 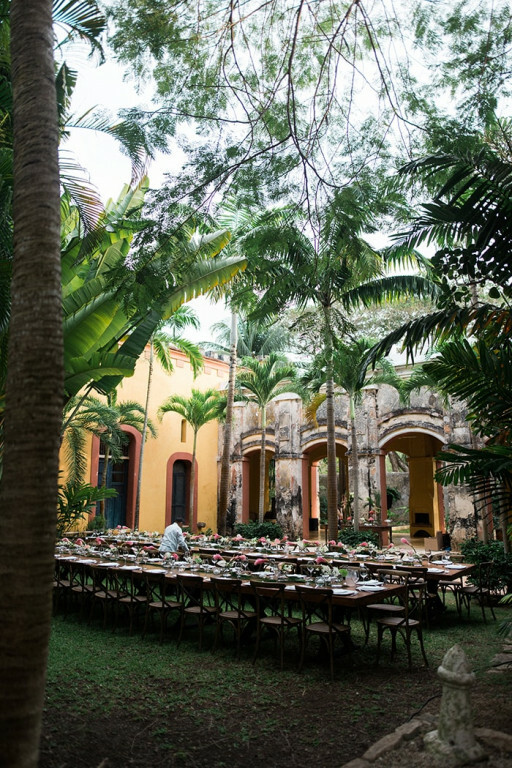 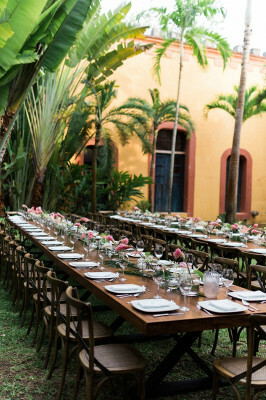 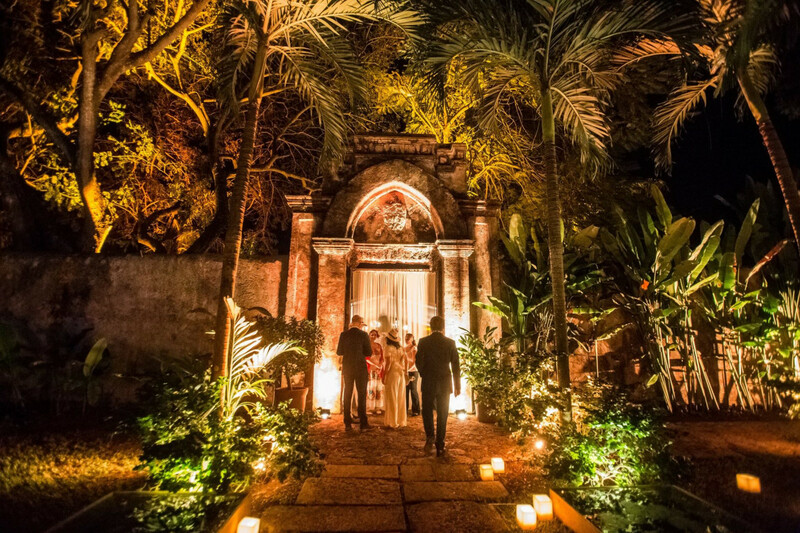 Many guests have stated that "as nice as the property shows in the photos, in person the historical architecture combined with the light and sounds of the Yucatan make hosting an event at hacienda Sac Chich a memorable event. Bars and lounges can be set up in multiple areas such as: pool areas, loggia and central courtyard at the hacienda. 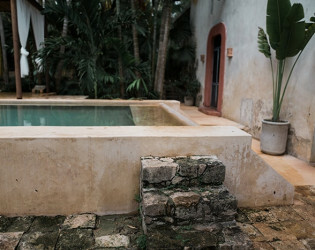 Pool and living area at Casa Sisal. 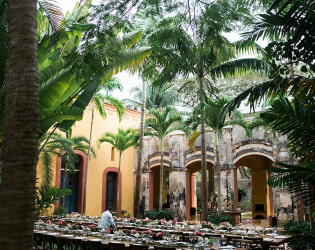 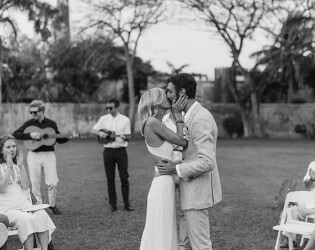 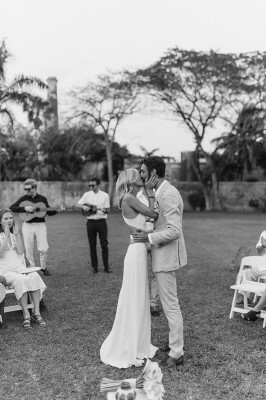 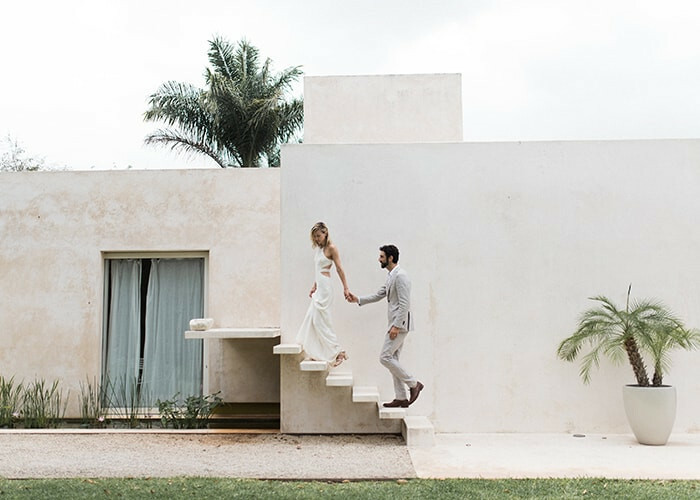 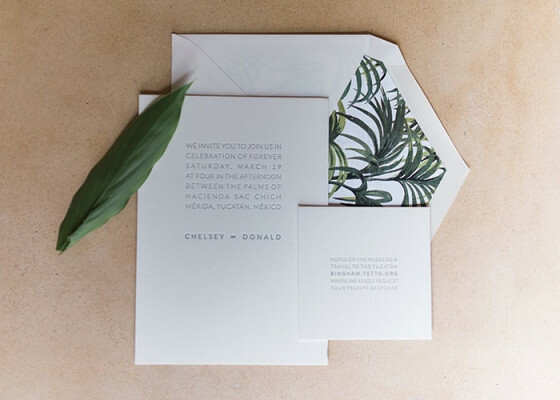 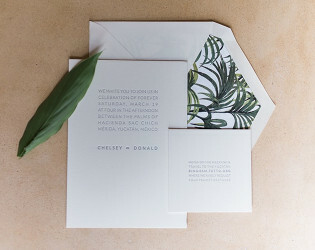 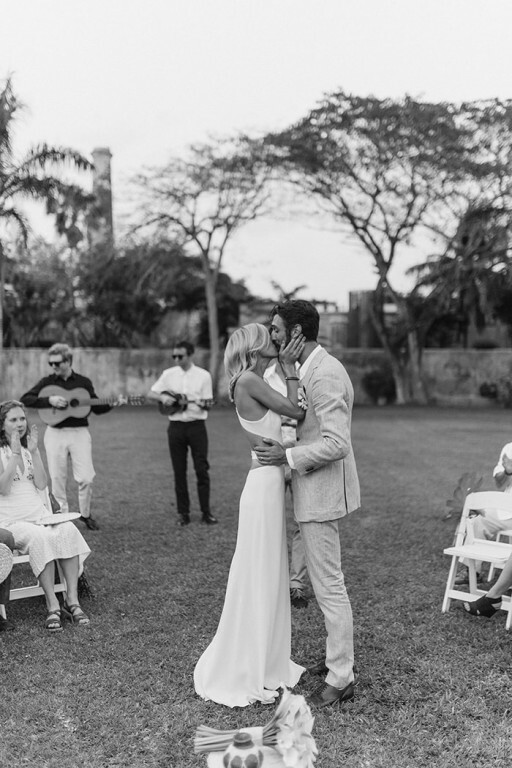 When we were contacted by Howard about his lovely property in the Yucatán we were thrilled, not only by his stunning venue but also because of his excited nature and gracious demeanor throughout our correspondence. 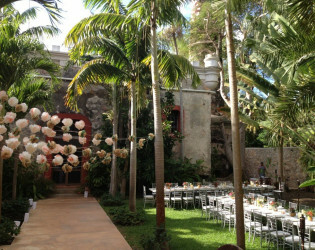 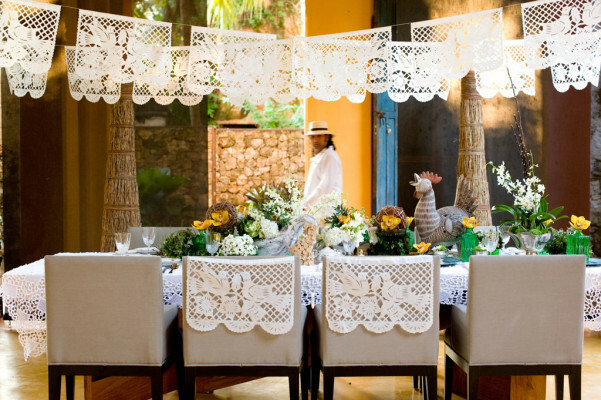 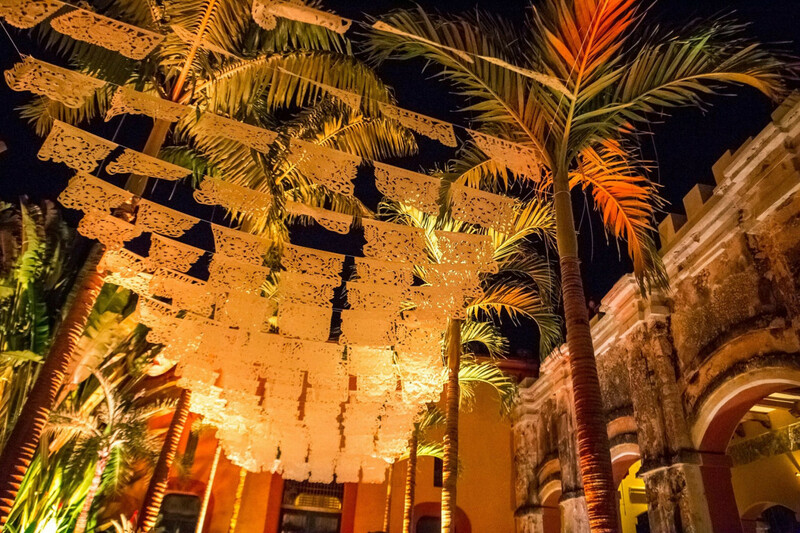 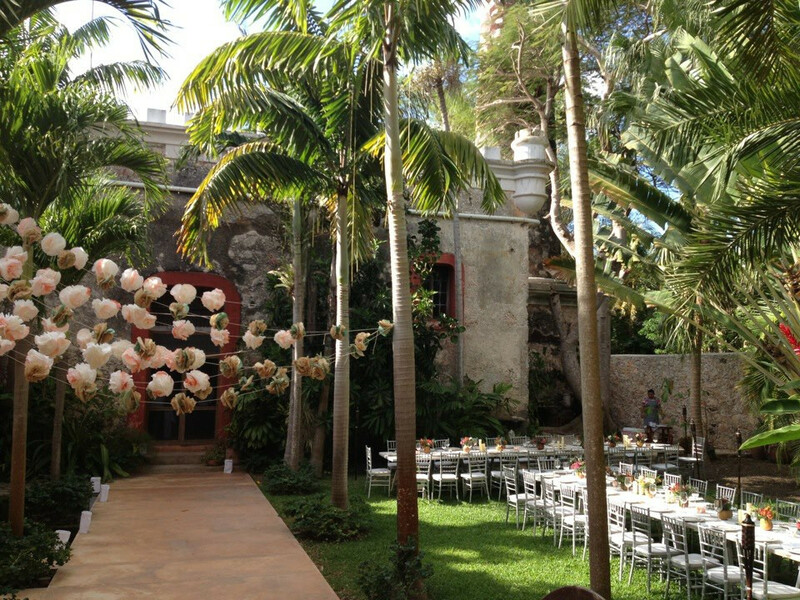 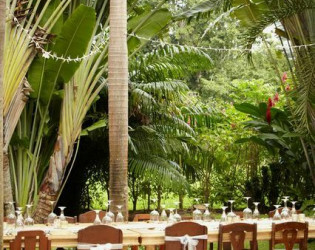 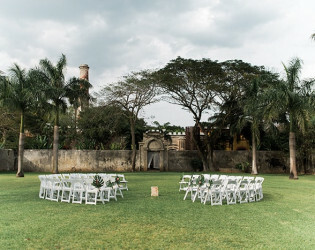 We quickly learned about his glittering getaway and venue space, Hacienda Sac Chich. 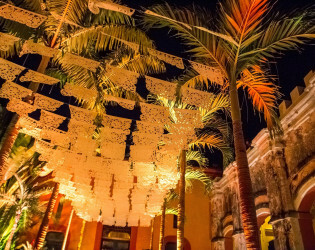 Maracas and Mariachi bands here we come! 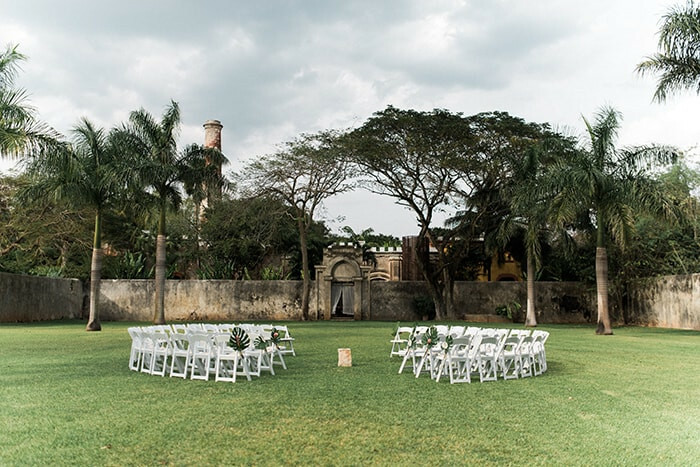 Tucked away on the lush grounds of Hacienda Sac Chich lies Casa de Maquinas, comprised of 3 limestone buildings, a water tower and a stately, 85ft chimney. 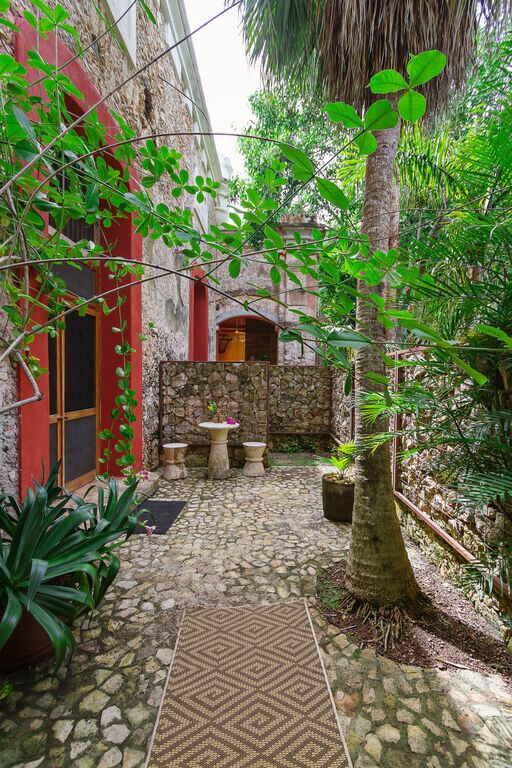 Surrounded on all sides by the exotic greenery of local Mayan Palms belies the antiquity of the building's history dating back to 1850. Sprinkled throughout the Hacienda there is evidence of the property's utilitarian past. Within Casa Nueva lie iron wheels and massive, exposed beams juxtaposed with the sunken modernity of the master suite's settee and refreshing plunge pool. 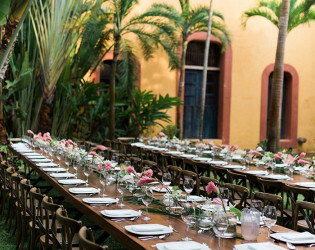 Moving through more of the venue brings one to the open-air living room and dining room called the Loggia, surrounded by reflective lily ponds. 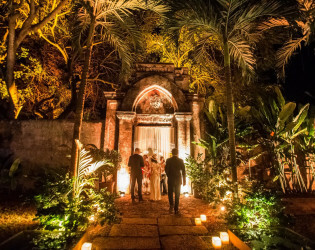 With closed eyes one can imagine the spectacular revelry good wine and music would bring and overtake the senses, one at a time. Climb the dramatic spiral staircase to the rooftop lounge and star-gazing platform. 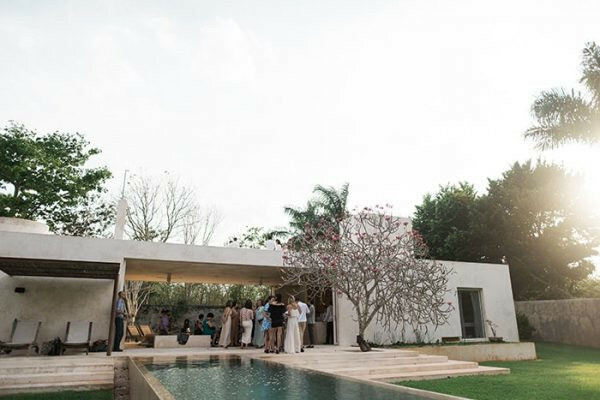 As the sun slips past the horizon and the night becomes tender in it's soft embrace nothing in the world could possibly seem as important as drinking in that view. 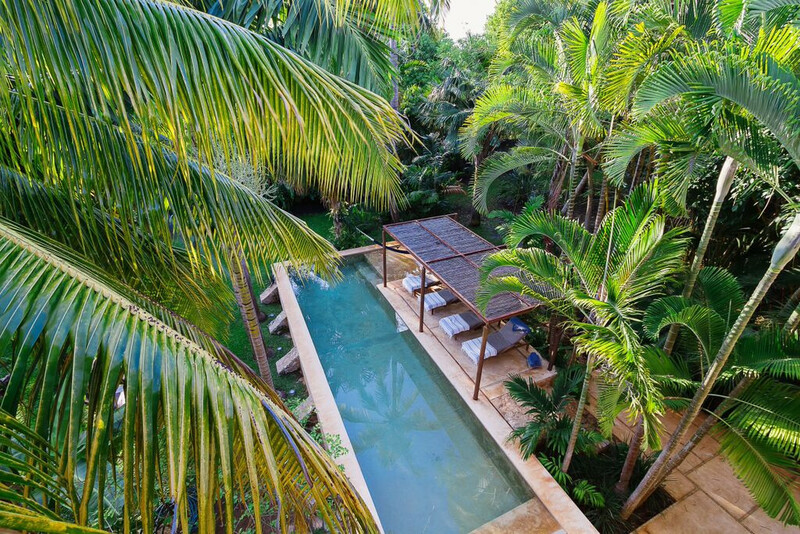 Continuing our exploration through a seashell mosaic tunnel (worth the visit just to say you walked through a seashell mosaic tunnel) one arrives at the 40-foot pool, a shimmering refuge from the glorious Yucatan heat. 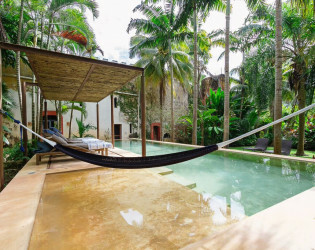 A steel and bamboo pergola and playita of shallow water lie beneath a sweetly suspended hammock begging for an afternoon siesta. 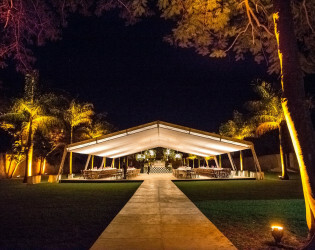 Beyond the pool lies a bocce court for impromptu competitions and much-needed leg stretching in the cool of the evening sky. 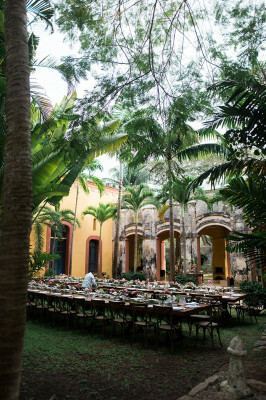 Casa Sisal is the third building in the Hacienda Sac Chich, Casa de Maquinas trifecta. 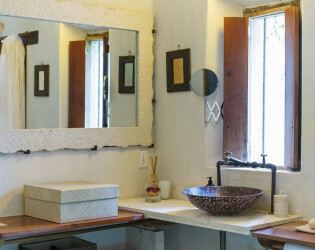 Want a little more privacy from the rest of your guests? 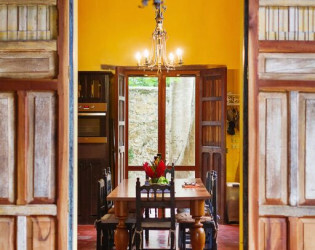 It's surrounded by more lily ponds as well as 2 acres of henequen drying fields and enclosed by 10-foot walls creating its own private, delicious world. 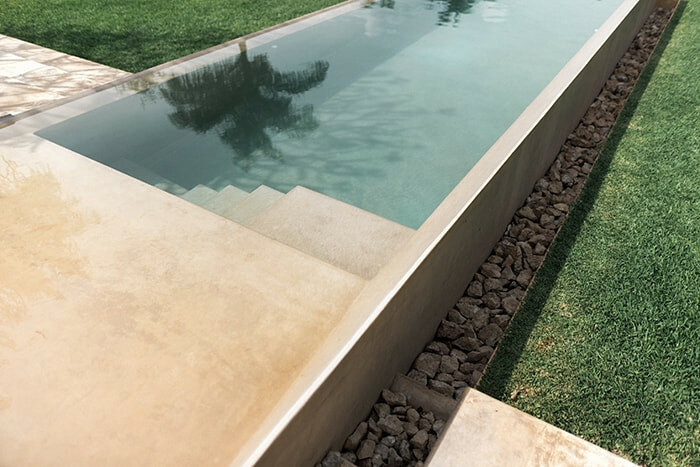 Walk out of the living area and you'll find a 3-sided Infinity pool (yes, another one! 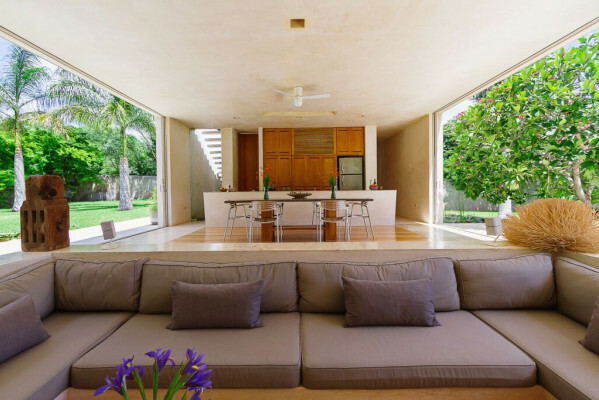 ), palapa and patio. High entryways and ceilings add to the grand feeling of open space and heighten the drama. 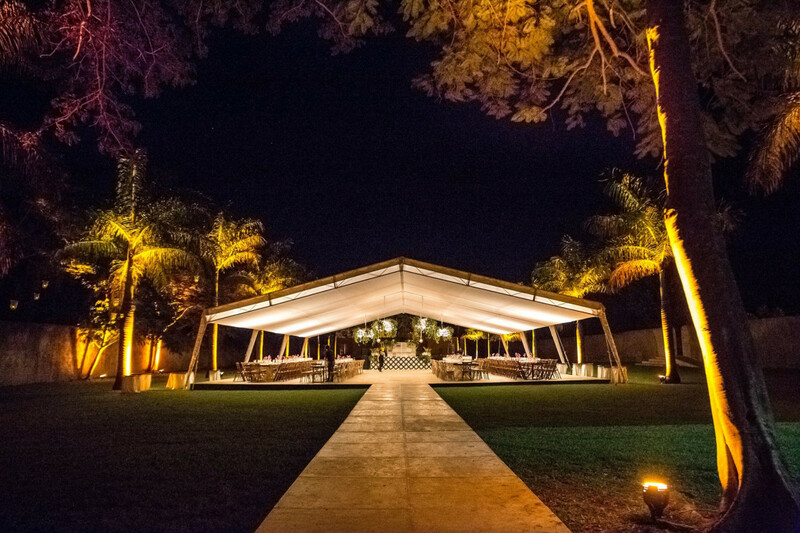 As special and relaxing as the property is at night, 175 outdoor architectural lights coupled with the star-gazing platform make this property truly sing at night. 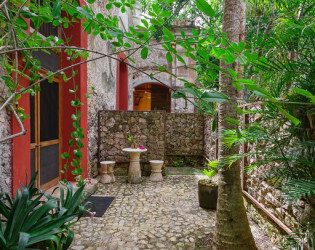 Tucked away on the lush grounds of Hacienda Sac Chich lies Casa de Maquinas, comprised of 3 limestone buildings, a water tower and a stately, 85ft chimney. Lush gardens & grounds of Casa de Maquinas.